The weather at the end of the summer improved, and the birds with it. By early September there were some great gatherings, with hundreds of Starlings and House Sparrows and one spectacular mass of martins. It was a brilliant autumn for Yellow Wagtails. They no longer breed locally it seems, and are hardly ever seen passing through in the spring. But a few do like to stop by on their return passage in the autumn. And this year a lot did, with groups around the stubble and paddocks of Place Farm and Firle Bostal from the end of August until mid-September. For a couple of weeks, you could hear them almost every time you went outside in Firle – they have a distinctive ‘tsip’ call, and can’t seem to help but make it when they fly. From around 10th September, these were joined by their cousins and our more reliable visitors, the Grey Wagtails. Not as numerous as the Yellows, and more often in ones and twos than flocks, they’re like clockwork, with our local birds (a pair usually breed in the park somewhere) supplemented by migrant birds. And unlike the Yellows, the Greys often feed in the village itself, visiting rooftops and gardens, puddles and ponds, and linger late into the autumn or even stay the winter (by which time the Yellows are in much warmer climes). Listen out as you walk along The Street in Firle – they make an explosive ‘chip-chip-chip’ as they go, bouncing along at rooftop level with their bright lemon underbelly. Birds of prey are often more noticeable at the end of summer, with parents busy feeding and young birds practicing to hunt. Buzzards fledged from the park, making pathetic mews as they circled over the village, and Kestrels from the box at New Elms. The Kestrels can often be seen perched around the barn at New Elms, where they have apparently replaced the Little Owls, which haven’t been reported since early in the year. Fortunately the owls seem to be doing better elsewhere, with birds taking up residence in a chestnut near the Stew Ponds, and often being audible from the centre of the village. One afternoon in early September, I cycled past the allotments to find the local Blackbirds and Chaffinches in a frenzy – with a wandering Little Owl being the cause. It was being forced to move from tree to tree by their constant attention, and I haven’t seen it since, so it looks like they upset it successfully. 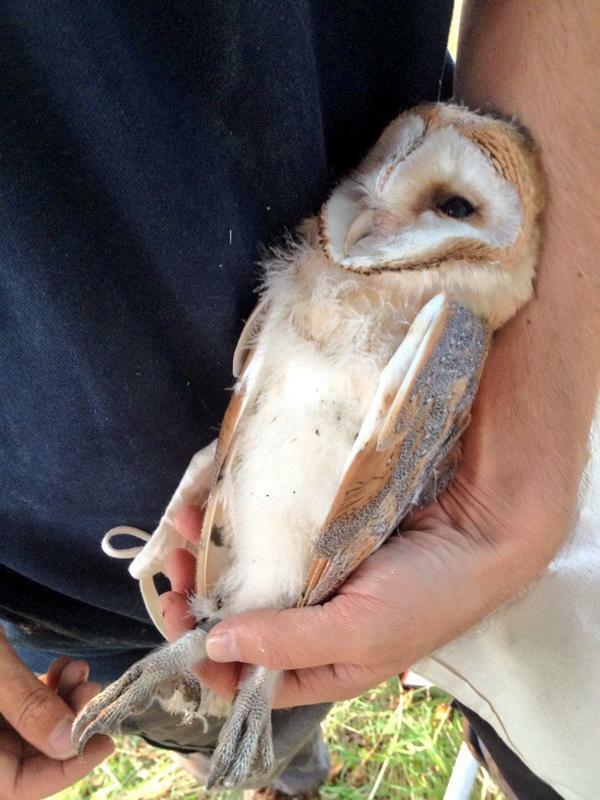 Barn Owls may have done well this summer – they need good dry spells to hunt in, and we’ve had plenty of those. In mid-September, there was still a brood in a box in Firle, made up of four healthy-looking owlets almost ready to fledge. They’ve all been ringed (metal bands around their legs), enabling us to understand more about them if they’re picked up again later in their lives (sadly that’s often along the side of the A27). On 20 September, the first Red Kite in a while was seen circling low over Wick Street, by Paul S. Hobbies were seen occasionally, with two together at Glynde Station one morning, and Peregrine on a few occasions. The falcons had a good larder to raid, with the biggest build up of martins and swallows I’ve ever seen. One morning, the wires all the way from Place Farm to Firle Bostal were smothered with birds – I estimated 4000, mainly martins. This is more than three times as many as I’ve seen at once in Firle before, and it was loud too! Other birds passed through in more modest numbers, but included a Garden Warbler and a couple of Lesser Whitethroats in the village, and Whinchats, Wheatears and a Redstart on the escarpment. As we approached October, the later migrants began to appear, with Meadow Pipits and Goldcrests forming the advance guard for the Fieldfares, Redwings and Bramblings we can expect later on. Seen or heard something interesting? Email cpeverett@gmail.com, leave a comment on the blog or tweet @firlebirds.